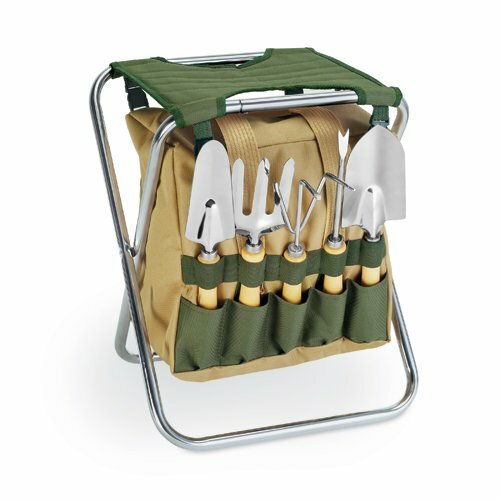 Gardening just got easier with the Gardener by Picnic Time! The Gardener is a folding seat and detachable polyester storage tote all-in-one. The storage tote has two zippered openings, one on the backside and one on the top for easy access from any angle and it conveniently holds 5 metal garden tools (large trowel, small trowel, garden fork, rake and weeder) on the exterior of the tote so they are readily accessible when you need them. All 5 tools have wooden handles and leatherette straps for hanging. Makes a perfect gift for those who love spending time in their garden.